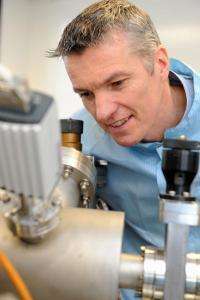 Molecular Solar Ltd, a spinout company from the University of Warwick, has achieved a significant breakthrough in the performance of solar photovoltaic (PV) cells. They have achieved and demonstrated a record voltage for organic photovoltaic cells that means these highly flexible, low cost solar cells can now be devolved for commercial uses in a wide range of consumer electronics. "This is an important advance. We are now very close to having highly flexible organic photovoltaic cells that will be capable of delivering electrical energy at a voltage suitable for recharging lithium ion batteries that are widely used in portable consumer electronics. Remarkably, this high voltage is achieved using a cell with only 4 junctions (sub-cells)''. Andrew Oldfield, Head of Cleantech at Mercia Fund Management said, "We were attracted to Molecular Solar's unique approach to realizing truly flexible, environmentally sustainable photovoltaics that are well matched to the burgeoning portable consumer electronics market." Molecular Solar are currently finalising a £5m investment round to complete the up-scaling of their OPV and MS-Flexifilm electrode technology. Graphene organic photovoltaics, or, will joggers' t-shirts someday power their cell phones? in a related issue, they dont mention the sort of area of cells required to say run a smart phone, which is obviously a function of efficiency, which they dont mention. Hmmm whats the point of having a solar charger for your smartphone if the sun has gone down before its finnished charging? Duh! Since the sun does not shine 24h a day any solar powered device is obviously useless, huh? Why not just plug it in a bit earlier? Think of what those poor fellows must go through trying to do solar cell work in that dimly lit land! Less UV radiation means longer lasting PV cells though.